My first thought was actually, “Oh, Erin has a nice smile!” I can relate with the needing to get back to running, though. I started back Friday, and while I didn’t love it, it wasn’t awful either. I think I can lie to myself convincingly enough for long enough to get back into a routine. gah. That should read “making bodice slopers”. I will now tap dance to distract from the awkward double-post. Is there a local sewing group or meetup that could help you work on your muslin? You might be best starting with one of the Big 4 slopers and adjusting from there. Or if you could have someone take very precise measurements, you could use those in tandem with Joi Mahon’s (sp?) fitting class on Craftsy. She teaches how to use your measurements and apply those to adjusting a pattern. I have enjoyed your posts very much over the years, and have been inspired to search and find some of the patterns you used to make dresses too! Well, actually I found only one, but it’s in my queue with fabric swatches and all waiting to be made up. The girth issue is something new for me too, so it’s probably good that I haven’t made the dress up yet since I wouldn’t be able to fit in it now anyway. There a really good craftsy class on bodice slopers. like amazing. its pricey but there are regular flash sales for $19.99 and it’s like a 6 hour class at least. I’ve bought all 4 over the past few months on sale! I use the pivot and slide technique from “Fitting Finesse”. It’s simple and has worked so far. You do look nice in your dress. Rhonda from Rhonda’s Creative Life has a great tutorial on how to draw up your own sloper. I find her tutorials to be very simple to follow. She makes what could be quite a difficult process quite easy. Or go thrift shopping until you find something that fits very, very well and take it apart. It feels like cheating, but you get an immediate result, and you can compare it with previous work to see where the changes are for knowledge’s sake too. And order a standard-size sloper based on your measurements (not the custom-sized). And the String Codes sloper is where she started. You will probably still have to tweak your sloper, but I think this is the most painless way to get you where you need to go with minimal work. Thanks for sharing, Kim! I’ve gotten totally addicted to using my sloper for fittings. It really speeds things up! Yay, weight lifting! 200lb deadlift HOLY CRAP. Congratulations! I’m only up to a 145lb max. #2389 works because it has no darts at all – it’s a bias cut so it gives where you need it to and it relies on gathers for bust fullness. using those same principals, you can add a center front seam to this pattern and cut the fabric on the bias. you can then use your side dart or change out to a set of gathers coming from a small shoulder yoke. bias darts are a pain, so be sure to back up the seam itself with lightweight nylon hem binding or something similar, but it’s still easier than going the gathers route. You can add to the waist at the darts, as well as at the sides. I would divide the amount you want to add fairly evenly between the dart legs and the side waist. Adele P Margolis writes very comfortable and engaging books. They are not drafting books per-se – you aren’t going to whip up a sloper from measurements. But once you’ve got a well-fitting basic bodice and skirt, she’ll walk you through any modification and design possibility you can think of. She expected that her readers would start with a simple bodice/skirt/sleeve from published patterns, fit them, and work from there. I like Make Your Own Patterns , but you can only get it second hand. Looks like Dover has a reprint called Make Your Own Dress Patterns, which from the illustrations is exactly the same. Maybe start by merging sizes – cutting a couple of sizes bigger at the waist than for the top half of the pattern. which just looks Lara-sized, you can’t tell that there’s everything from M to XL in there. Also have a try with Lekala – which would give you a starting point that would probably fit, and that you could then modify for style. And jersey or stretch wovens might help while you work it out – that way you don’t have to be as precise. Volunteer your problem to the costume department of a local university! Then stand at a student’s elbow and take copious notes. Design students need the practice drafting for different body types; they can share knowledge with you; they may have picked up some hints and tips along the way that you can use. They have access to some majorly technical textbooks and reference materials. They may have an already-drafted sloper that you can trace off for your own use. Bring snacks with you. Best commercial drafting book I’ve ever used is the Make Your Own Dress Patterns volume by Adele Margolis. You can find it used many places; it may have been reprinted in recent history. Start with a rectangle of your largest measurements (length and width) and do subtraction to get to the smallest measurements — sounds so very simple, doesn’t it? Yet each of us is different, one from another, and the details really matter when it comes to fit. And you probably will get best results by both letting out side and back ( and center front if present) seams, *and* adjusting front and back darts. It’s all about balance. I would read what you write even if it was about, oh, I don’t know, mechanical engineering. This is such a fun, interesting, relatable post and the comments — so helpful! If you just want to tweak patterns, and have neither the time nor inclination to learn full on pattern drafting, I highly recommend he book Fast Fit, by Sandra Betzina. All her books are good, but this one in particular is sort of a gateway book to pattern drafting. (It was for me, anyway. Everything about the way I make clothes changed after reading it.) Sandra’s book is full of great tutorials on hacking commercial patterns (both literally and figuratively) for better fit, and about learning to see where it is that you need more, or less fabric in order to ensure garments made with commercial patterns fit your body. Btw, if the patterns you’re used to using still fit everywhere but the tummy, there’s a VERY simple pattern alteration for adding a bit of extra room where you need it, without changing much else. Page 194. The easiest sloper instructions I’ve come across are in The Costumer’s Handbook (not to be confused with The Costume Designer or Costume Technician Handbook) by Rosemary Ingham and Elizabeth Covey. I used that book a lot when I was starting out! It looks like you might be stuck with a used copy (I don’t think it’s still in print). When creating a bodice, it helps to think in quadrants, with darts in the middle. If you’re expanding the side seams, you really have to expand the center front and center back as well. And, you look fine! Good luck! I’ve made lots of matching dresses for 4-6 young ladies using the same pattern for each set. A friend several years ago suggested taking the pattern pieces and copying them 3% larger and then 3% larger until it fits. Not sure why this works, but it usually does. Added “girth” does not need just more fabric around, but more fabric up and down to cover additional, well, “girth”. You may need to adjust another area down a little, but that is easier. Keep up the good work, I know it takes a while to recover from some injuries. Make sure you are lifting correctly and with a spotter. Nothing worse than dropping weights and redamaging muscles (yes, that was said in the voice of experience!). I guess you’ve already had loads of useful advice on the topic of slopers, but being a fanatic pattern maker myself, I thought I’d add mine as well. First of all, there are many different kinds of slopers and different methods for drafting them. 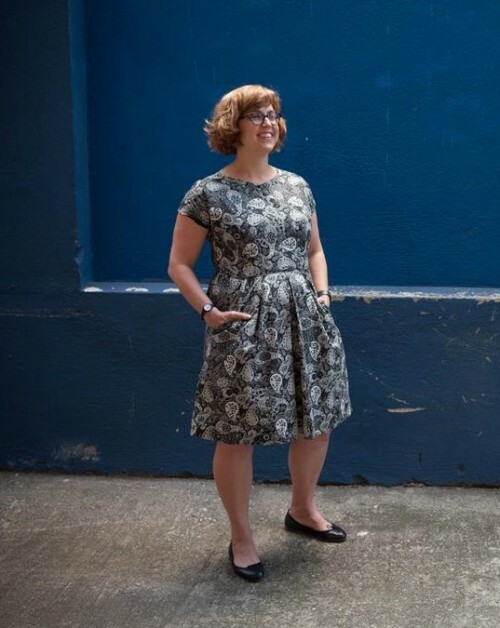 Since what you want is a bodice sloper with dresses with a waist seam, there’s no need to fuss with hip length slopers (great if you want to make a range of garment but also usually more complicated). And it would be fine to have one with a ‘normal’ amount of wearing ease. By which I mean normal for your preferred fit. Which means you won’t need a zero ease sloper, although you could use one as a starting point. I certainly recommend making a sloper with sleeves. You will sometimes want to make a dress with set-in sleeves and, contrary to popular opinion, you can’t just slap some sleeve from some pattern on to a bodice which is drafted to be used sleeveless and expect it to work (there’s some ease of movement needed around shoulder and armscye when there’s a sleeve) . Oh, and feel free to email me with drafting questions. I can’t guarantee I can help, but I will most certainly do my best. I don’t know why you say that this picture is not very flattering, I think it is great because it looks natural and not like you are posing and faking a smile. Also love the pattern on the dress, it looks really good on you! Feeling compelled to comment because you are asking a question related to my specific area of expertise. You look great, by the way – no need to focus in on “girth”, specifically – you just need to know how to make the pattern fit YOU. We tend to think of a waist adjustment as a simple circumference problem. But it isn’t, right? If you have a belly now, and you didn’t before, the “extra” is in the front, right? Now, imagine that your belly is like a single breast, and what you would do to alter a pattern to accommodate a “bump”. Slash the pattern piece horizontally from center front, spread vertically, and add to the center front seam (if there is one) by angling it to give you more room, if needed. If cut on fold, angle the piece away from the center fold as you approach the waist. If nothing (or little) has changed at your back waist, no alterations are needed there, unless your girth requirement makes you need more length in the bodice all the way to the side seam. Make sense? Ask me, if you need any further clarification. I’ll be happy to help. Sandra Betzina ~ does THE BEST job on adjusting on the pattern for your measurements. She tackles the big 3 but makes adjusting easy and her fitting works! You look great! Liberty covers all sins of sewing. My favorite fitting helps are Sandra Betzina’s books as recommended by others above; and I offer another simple solution. Cut your bodice an inch or two wider and three or four inches longer than the pattern, BASTE it together, and try it on inside out. Use pins or a marker to adjust it as you like it, and mark where you want the waist line. Then stitch, and sew on the skirt. A friend’s help can make this easier. I have had a tummy far too long and it has changed my formerly attractive waist. A longer bodice and dropped waistline can be very flattering, but I am also short waisted, so I try to make my waist look longer and my tummy screened from view. Basting is a really good strategy even if it takes a bit of time. Good luck. And thanks for so many wonderful postings on pattern illustrations and words. Hi Erin, Nice dress you wore for this article and you pocket dress is bit different from other but I like it. I just can’t help thinking what a good runner you would be now with that core and hip strength. Have you stopped posting, or is the website failing to update again? All I can see is your June 3 post. maybe you’ve already tried this, but. i have a large waist. it’s barely smaller than my bust & hip measurements. i have found that simply adding length to the front bodice works wonders. i slash & spread, grading out to nothing at the side seams, because i personally don’t need any length in the back. but adding length in the front helps a bodice fit over my belly & i often don’t have to do any alterations beyond that.